The 23-year-old reigning Dally M Halfback of the Year has played 107 games for the club he debuted at in 2013. 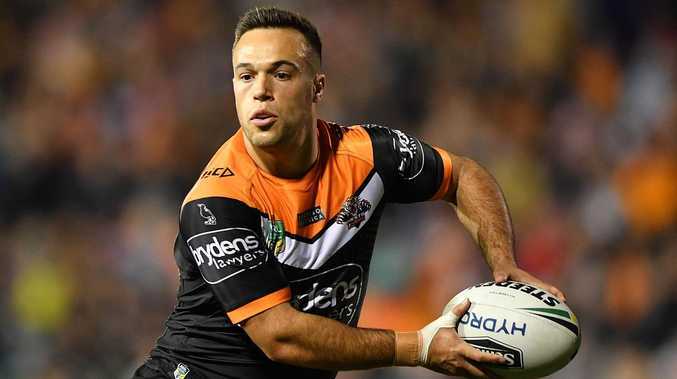 He had a breakout season in 2018, playing alongside club legend Benji Marshall, and new coach Michael Maguire publicly declared he was pulling out all the stops to re-sign the diminutive No.7. Maguire said the Tigers would be Brooks' team, and a big part of his sell was the success he's had working with halves. "Luke is a well experienced half now and at the prime of being able to take all of the learnings to this point to a whole new level," Maguire told the Wests Tigers website. "Sitting down and talking to him about his game he's hungry to learn and hungry to improve on where he's at. He prides himself on his defence and obviously he's very keen to learn the different styles of play that I've had experience with working with a number of halfbacks over a number of years." Brooks, a local junior, said that was a big part of the reason he decided to ink the new deal. "I'm pretty excited to be here for the next five years, I've been here my whole career and I'm happy to stay," said Brooks. "We're building something nice here, with Madge [Michael Maguire] coming in he's a successful coach and I think he's going to be good for our team. "I just want to build on what we did last year as a team and for myself I want to keep playing consistent footy. "I want to do my bit for the team and grow as a player and a person and work on my leadership as well. "I've been in first grade for five years now and that's a side of my game that I want to work on, the leadership around training and on the field as well."